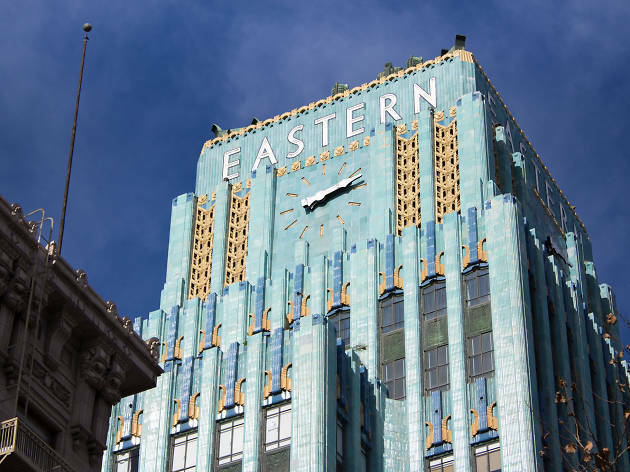 As Broadway continues to bounce back, the Eastern Columbia Building stands as a reminder that the Downtown street has always been beautiful. The stunning Art Deco tower never seemed to make its way into LA iconography, but since a major 2004 renovation its become a beloved landmark for Angelenos. 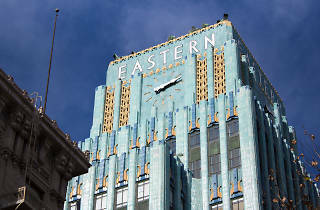 The turquoise finish, terra cotta sunburst over the entrance and the blue glow of the clock tower are all headturners. Easily one of Downtown's most stunning buildings. It looks incredible from every angle—whether peering up from the street or stealing a glance from atop Ace Hotel. The color, of course, is the building's standout feature, but the sunburst above the entrance, the gold detailing and the "Eastern" type atop the clock tower are all equally brag-worthy.